This movie took two of the most popular comedians today and let them play with each other. Will Ferrell and Zack Galifianakis star as two politicians running for congress in North Carolina. 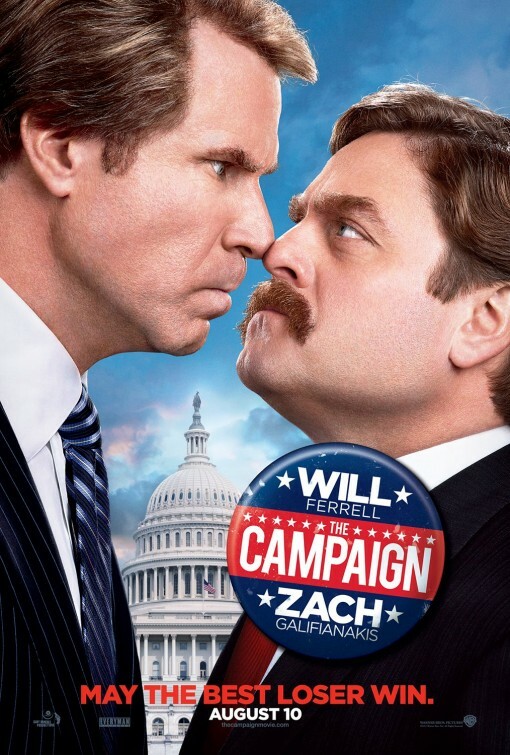 Ferrell is very funny as the long term congressmen, Cam Brady, who must put up with a new challenge from a naive dimwit, Marty Huggins (Galifianakis). Ferrell hams it up well as a political stereotype, kissing babies whenever possible, spouting off about his love of religion and the hard working people of America. He has been a congressman for five terms and is not prepared when Marty Huggins challenges him in the upcoming elections. Huggins is being backed by the corrupt Motch brothers (John Lithgow and Dan Aykroyd), who believe that Huggins will be easily corrupted and let them continue their dirty dealings unabated. They hire a flashy campaign manager (Dylan McDermott) to run Marty’s campaign. Eventually Marty begins to move up in the polls and Cam Brady realises he has a fight on his hands. Galifianakis was coming off his breakout success of the Hangover when he made this film. He is very funny as the laid back tourism manager who wants to make his dad proud by running for office, not realising he is being taken advantage of. While Galifianakis is good, this is Ferrell’s show. He has a history of appearing with the flavour of the month comedians, after making Blades of Glory with Jon Heder after he had success with Napoleon Dynamite. He had better chemistry with Heder, but this film is still very funny. I really enjoyed Ferrel and Dylan McDermott as Marty’s campaign manager. The changes he makes to Marty’s life, hoping to make him more American are very funny. Jason Sudeikis was also very funny as Ferrell’s number two. This film is entertaining and well worth watching. It’s not Ferrell or Galifianakis’s best work by any means, but it is still a good time on a rainy day. When I saw The Campaign in theaters, I thought it was funny, but in an uncomfortable way. Though it was trying to be as deliberately over-the-top as possible, it was still too close to the truth. It hit on way too many real life scenarios that have been playing out in campaigns across America for decades: the Democrat cheating on his wife, the Republican pretending to be something he’s not to gain votes, corporate money buying the loyalty of candidates, one politician making dubious “connections” between his opponent and Al Qaeda, a candidate shooting someone and somehow becoming more popular… all actual things that have happened (and will happen again, no doubt). But we’re nearly two years away from that election year, and I can laugh a bit more freely at this political lampoon. My only wish is that it were funnier in general. It’s definitely not Will Ferrell’s or Zach Galifinakis’ best (Anchorman and The Hangover, respectively), but it has its moments. I enjoyed the little gags, like Galifinakis getting a patriotic home makeover, which includes a gun cabinet and having his “Chinese” dogs (pugs) replaced with more suitable “American” dogs (a lab and a retriever). Or how Ferrell’s flag pin gets bigger and bigger as he sinks in the polls. These are the types of things that seem completely ridiculous, but at the same time seem plausible given the competitiveness of today’s elections.